April 12 – Tottenham have been charged by UEFA after a spectator ran on to the pitch during their Champions League win over Manchester City on Tuesday. The incident occurred late in the quarter-final first leg – Spurs’ second match at their new stadium – when a man confronted City full-back Fabian Delph before being escorted away by a steward. Delph had earlier been involved in a tackle with England captain Harry Kane who was taken off injured and is likely to miss the rest of the season. 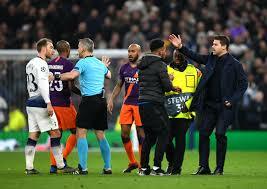 Spurs manager Mauricio Pochettino took to the field to try and intervene, while referee Bjorn Kuipers prevented Tottenham’s Danish international Christian Eriksen from getting involved. The case will be dealt with by European football’s governing body on 16 May. UEFA has imposed fines of this season on clubs for a first offense of pitch invasion but the incident follows two similar occurrences in the English domestic games. A fan was jailed for 14 weeks for running on to the pitch and attacking Aston Villa midfielder Jack Grealish during their derby at Birmingham City last month while on the same day, Manchester United defender Chris Smalling was shoved by a spectator who had entered the field during a Premier League game at Arsenal.